Shakers are an invaluable tool in any percussionists arsenal. You'll find them used in just about every genre of music out there. Meinl Percussion offers you this great color-coded four-piece egg shaker set to cover all the bases. White is soft and ideal for quiet ballads, grey is medium for an all-around excellent studio shaker, red is loud for more cutting sounds, and the black is the loudest for higher volume and live situations. So if you're in need of great shakers, or are just looking to add a new sound, check out the Meinl Four-piece Egg Shaker set. 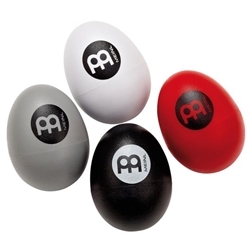 Get the Meinl four-piece egg shaker set to complete your percussion arsenal.